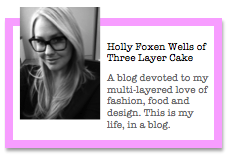 Three Layer Cake was mentioned over on MadeByGirl today! I have said it once and I'll say it again, if you haven't checked out Jen's blog before or her fabulous online stores, MadeByGirl and Cocoa&Hearts, you must go take a look-see! She is one of my favorite bloggers around and her art is beautiful... I'm sure you've seen her LOVE prints floating around the blogosphere before. Yay! Congrats doll, this is awesome - go you! Congratulations! I just found your blog though MadeByGirl and I absolutely love it! There is a new post on my blog and I would love to hear what you think, so do stop by.